Combinations and Permutations are smaller groupings of objects often selected from a larger population. Objects in a Combination are selected simultaneously from the population. Objects in a Permutation are selected sequentially from the population. The concepts of combinations and permutations are closely related. A typical problem will ask how many combination or permutation groups containing x number of objects can be obtained from a larger population containing n objects. Combinations - Elements are picked simultaneously, all at once. Permutations - Elements are picked sequentially, one after another. The Number of Permutations = nPx = n! / (n - x ) ! = nPx = 9P4 = n! / (n - x )! = 9! / (9 - 4 )! Problem: A company is evaluating 6 investment proposals. If the company selects 3 of the proposals simultaneously, how many different groups of three investment proposals can be selected? This is a combination problem because the three investment proposals are selected simultaneously. Problem: A consultancy wants to open 4 offices in 10 Northern states. Each new office will be in a different state. The offices will open all at the same time. How many different ways can these four offices be situated among the 10 possible Northern states? are to selected as locations simultaneously. Problem: A consultancy wants to open 4 offices in 10 Northern states, 3 offices in 9 Southern states, and 2 offices in 8 Eastern states. Each new office will be in a different state and all offices will be opened at the same time. How many different combinations does the company have to evaluate? = 10P4 / 4! * 9P3 / 3! * 8P2 / 2! Problem: From a group of 10 men and 8 women, a committee is formed. The committee will have 3 men and 4 women. How many different ways can this committee of 3 men and 4 women be formed from the overall group of 10 men and 8 women? All committee members are picked at the same time. This is combination problem because all committee members are picked at the same time. The problem asks how many ways can all possible combinations of 3 out of 10 men be combined with all possible combinations of 4 out of 8 women? of n different objects taken x at a time Simultaneously. = 10P3 / 3! * 8P4 / 4! Problem: How many ways can a group of 12 people be divided into one group of 7 and another group of 5? This is a combination problem because all members of any one group can be picked simultaneously. One way to solve the problem would be to determine the total number of 7-person combinations that can be formed from 10 people and then multiply that number by the number of 5-person combinations that can be formed from the remaining 5 people. = 12P7 / 7! * 5P5 / 5! Problem: A milkman makes 7 deliveries on his route. How many different sequences can he make to complete all 7 stops? This is a permutation problem because the stops are done sequentially. = n! / (n - x )! = 7! / (7 - 7)! This same problem above is solved in the Excel Statistical Master with only 1 Excel formula. You'll finally have a solid understanding of business statistics with the Excel Statistical Master. Problem: How many ways can 5 people be seated on a sofa if only 3 seats are available and the 3 seats are filled sequentially by the available 5 people? This is a permutation problem because the elements of the permutation group are filled sequentially. = 5! / (5 - 3)! This same problem above is solved in the Excel Statistical Master with only 1 Excel formula. 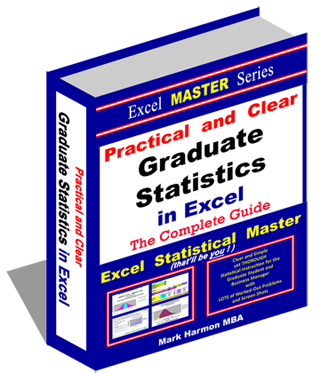 You'll be able to grasp your statistics course a LOT easier with the Excel Statistical Master. Problem: A group of 9 people needs to appoint 1 person to be group president, another person to be group vice president, and a third person to be group treasurer. If the group first votes for the president, then votes for the vice president, and finally votes for the treasurer, how many different executive groups can be created from the original 9 people? This is a permutation problem because the elements of the permutation group are filled up sequentially. = 9! / (9 - 3 )! This same problem above is solved in the Excel Statistical Master with only 1 Excel formula. The Excel Statistical Master is for you if you want to know how to apply statistics to solve real world business problems. Problem: How many ways can 3 books be placed next to each other on a shelf one at a time? = 3! / (3 - 3)! This same problem above is solved in the Excel Statistical Master with only 1 Excel formula. If you found your statistics book confusing, You'll really like the Excel Statistical Master. Everything is explained in simple, step-by-step frameworks. Problem: From the following six letters: A, B, C, D, E, F, how many groups of 3 letters can be created if none of the letters from the original 6 are repeated in any group? This is a permutation problem because none of the letters can be repeated. When the first letter of one of the permutation groups is chosen, there are only five remaining letters to choose from. Thus, the elements of the permutation group are filled sequentially. = 6! / (6 - 3)!